This is one of a number of studies that I did for my 2009 Christmas card. Although I knew what I wanted to portray, I spent quite a bit of time doing sketches and studies along the way. The intent was to show the landscape of British Columbia, as it changed due to the pine beetle infestation. The result was, firstly, dead forests, and secondly, the forests started to burn. 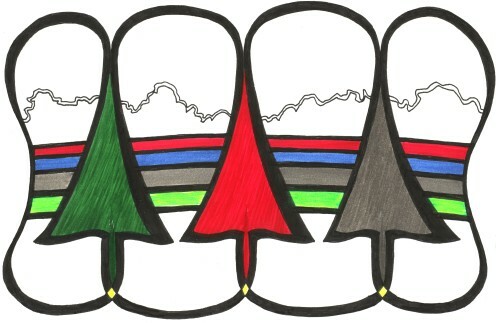 These stages are indicated by the three trees that are coloured green, red, and black. The drawing in done in pigment pen and ink and Prismacolour pencil on 110lb. bright white acid free paper from Canada. It is archivally matted in Crescent 1607 4-ply matte, in an OPUS metal exhibition frame.